Nemo Series There are 6 products. 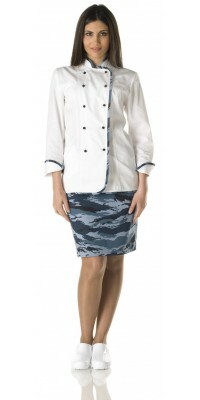 Clothing for ice-cream and pastry shops: the freshness of Nemo line will capture you! This line of professional clothing for ice-cream and pastry shops, called Nemo, is characterized by the particular camouflage pattern of the fabric, widely used also in the everyday clothing and particularly appreciated by the youngest. As to the colour, we preferred a bright tone of blue, black and air force blue, instead that the classical military pattern. 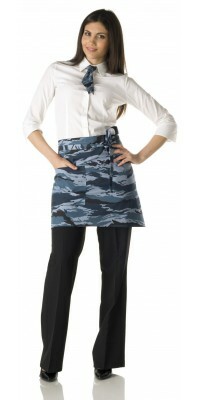 Nemo professional clothing line (aprons and accessories) is made of Panama Gabardine, a resistant cotton blend gabardine (65% Pol. 35% Cotton), that ensures it won’t fade nor shrink not even after several washes; Marika jacket, instead, is made of a fresher fabric (suitable even for the laboratory), called Soft-feel lightweight Gabardine (50% Cotton, 50% pol. ), that’s very comfortable and ensured even after many washes. 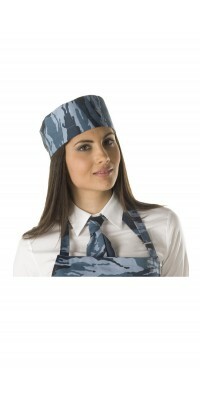 Unisex apron with bib, model Pescara with big pocket applied in the middleNemo patternsize cm.70 x 65Made of Panama Gabardine, 65% Pol., 35% Cot. Unisex short apron, model Foggia with big pocket applied on the right side Nemo patternsize cm 45 x 85Made of Panama Gabardine, 65% Pol., 35% Cot. Women's jacket, model Marika White, with Nemo pattern contrasting profile Black pull-out buttons Immediately available for delivery: sizes from S to XL Made of Lightweight Soft-Feel Gabardine, 50% Cot., 50% Pol. Unlined pencil skirt, model Ametistalength cm. 56 (hem to be made)Nemo patternImmediately available for delivery: sizes from 42 to 48Made of Panama Gabardine, 65% Pol., 35% Cot. Short tie, Nodino model with the knot already doneNemo patternadjustable one sizeMade of Panama Gabardine, 65% Pol., 35% Cot. Unisex Hat, model ToqueNemo patternheight 9 cmAdjustable one sizeMade of Panama Gabardine, 65% Pol., 35% Cot.